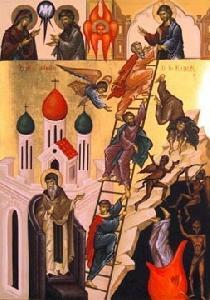 Fourth Sunday of the Great Fast: St. John Climacus; The Holy Martyr Codratus and Those with Him (249-51) – March 10. 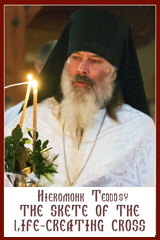 Divine Liturgy of St. Basil the Great. Troparion (Tone 1): O John, our God-bearing father,* you were shown to be a citizen of the desert,* an angel in bodily form,* and a worker of miracles. * Through fasting, prayers and vigils you received heavenly gifts* to heal the sick and the souls of those who, with faith, run to you. * Glory to Him who gives you strength. * Glory to Him who crowned you. * Glory to Him who works healing for all through you. Kontakion (Tone 4): On the heights of true abstinence,* the Lord established you as a reliable star,* giving light for guidance to the ends of the earth,* O father John, our teacher. Prokimenon (Tone 7): The venerable ones will exult in glory* and they shall be joyful in their beds (Ps 149:5). a forerunner on our behalf, has entered, having become a high priest for ever according to the order of Melchizedek. and Christ will shine on you.’ Be careful then how you live, not as unwise people but as wise, making the most of the time, because the days are evil. So do not be foolish, but understand what the will of the Lord is. Do not get drunk with wine, for that is debauchery; but be filled with the Spirit, as you sing psalms and hymns and spiritual songs among yourselves, singing and making melody to the Lord in your hearts. 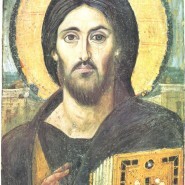 verse: Come, let us rejoice in the Lord; let us acclaim God our Saviour (Ps 94:1). verse: Let us come before His face with praise, and acclaim Him in psalms (Ps 94:2).